She Calls Me Tater is a three way threat – if you are looking for a horse that has the talent to do it all, this is it! She is very flashy and does very well in the hunter ring – winning high ribbons at Georgia Hunter Jumper Association (GHJA) shows over fences AND on the flat. She has the step and attitude to make the strides in a calm, confident manner. “Tater” is currently schooling changes, but will have them down in no time now that we are trying to get them (we put off this work because of her dressage work – we didn’t want to get her confused!) Schooling shoulder in, leg yields, and 10m circles. Dressage judges love her grace and three nice gaits. She has been successfully evented at USEA rated shows Beginner Novice and won the blue her first time out and ribboned 4th the second time – ending both times on her dressage score. This is a horse for competition! She trailers like a dream, is bold to the fences, has correct conformation and great feet. She clips, vets and stands quietly for the farrier. The best part is, she wants to be your new best friend with her super personality. She Calls Me Tater aka “Pretty” was one of our 25 Special Horses in December 2006. 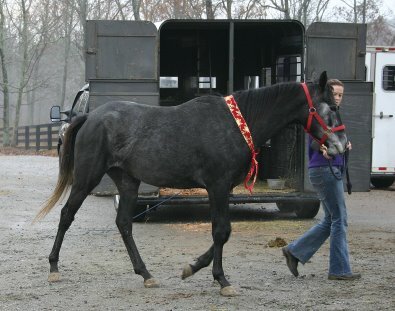 “Pretty” was She Calls Me Tater’s name when she was one of our 25 Special Horses we found homes for in December 2006. Contact Halliea Milner for more information and pricing.